About Aikido - a Martial Art from Japan. Aikido was founded by O'Sensei Morihei Ueshiba and diffused after 1950. It is the result of an entire life dedicated to the study of many traditional martial arts, merged into a new direction; goal of the founder of Aikido, was to create a world of peace and awareness, and Aikido is the method to achieve this target. Today, these disciplines, which are grounded in the ancient Samurai's techniques support a modern training for a personal growth according to the laws of nature. A typical Aikido lesson starts with an exercise called 'Sei Za' in which the students sit and relax trying to concentrate. Then the teacher and students perform a salutation called 'Rei', a specific series of warm-up exercises called 'Aiki Taiso' and a breathing technique called 'Kokyu' which closes this first part of the training. After this first part the teacher demonstrates the Aikido techniques which the students have to watch carefully and try to repeat. These techniques are always carried out together with a partner. Every student must always consider his/her partner as a friend helping him/her improving mentally and physically, and not as an enemy. This is an important point in Aikido that creates a peaceful and harmonious feeling during the lesson. 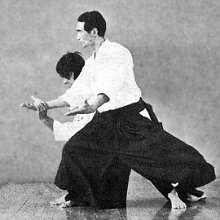 Aikido is not just a way to understand 'how to make a technique effective', but it is a particular training method that helps you reaching the 'Mu-Shin' the 'Non-Mind-State' principle, state in which techniques rise spontaneous, transforming continuously.